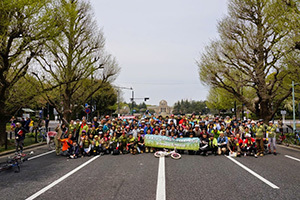 Tokyo Earth Day bicycle Ride(TEDR) is the event to re-find the joyfulness and the gratefulness of Bicycle in the Earch day which is to re-consider and appreciate Our living Globe. TEDR committee organize the event for the share of the opportunity to re-consider our lifestyle and environment of the Globe. We hope it is to be the trigger for everyone to start including the bike in your life. We want to spread out the sentence “Eeryday Earthday” for our Globe. Jingu gaien–Roppongi–Imperial Palace-yushima-Toyama Park- Jingu gaien. Let's feel the rediscovery of the close nature with riding bike. Please feel free to join us! Everyone is welcome! This is the event to feel the change and the nature in the center of Tokyo. If the even would be canceled, it is informed in this web page, Twitter and Facebook by 7:00 a.m. It is around the end of Icho Namiki(the streed lined with ginkgo) from Aoyama Street. Please check the map for the details. * on the way to the goal, we will take 15 min break in each group. Original Towel with Rien dyeing. Let's ride the bike for Japan! * The fee of sticker included donation, and it will be sent to the damaged area in Great East Japan Earthquake via Japan Red Cross. * We solicit the donation at the meeting place in Gingugaien Icho Namiki. We keep the rule and share the road with car and motorbike in the concept bike is a type of car. We keep the one line, and don't pass the others during the ride. We need to prepare the bikes by ourselves. It is prohibited to ride the bike without brake. The even on rain or shine. Only canceled in stormy weather. The cancellation is to be informed in the web by 7:00 a.m. Please prepare the rain wear if needed. Goods included in the entrance fee are only distributed at the meeting place. Please prepare ID for the registration in the even. Cameraman takes pictures in the event, and they will be on the web, we appreciate your understanding. Presses from Magazine takes photographs in the event. If you don't want to take your picture by them, please ask them by yourselves directly. We strongly recommend to wear helmets and gloves. Please check FAQ for the others. * Tokyo Earth day Ride is the even managed by volunteers. Will you join us as a member of volunteers? Pleas feel free to contact us. * Please send the email info@tokyo-earthdayride.org if you would like to join us as a volunteer staff. Pre-registration is required for the even. We cannot accept the join the day. © Tokyo Earthday Bicycle Ride Executive Committee 2019 All Rights Reserved.